* Total number of reviews and star-ratings are based on data collected during the time period Burkhardt Heating and Air Conditioning has been using the ReviewBuzz system and may not directly match the data found on each public review site. We had a central air-conditioning system installed in our 96 year old home, built in 1923. By its nature the job was huge, complicated, time-consuming and dirty. It took a week. The crew, usually consisting of 5, were on time, professional and personable. They explained the job at the beginning and as they began each major step. They cleaned up as they worked and at the end of each day. Their work looks great and it works! I cannot think of a negative thing to say. Two thumbs up! We had a central air conditioning unit installed in our home, built in 1923. The job took an entire 5 day week. It was complicated and difficult. Troy and his co-workers, usually a crew of 5, were all tremendous. They knew exactly what to do. Their work product works great and looks great. Troy seems quiet by nature. He was friendly without being obnoxious. He answered any questions we asked. He and his co-workers got along well. The job, by its nature, was dirty. They cleaned as they worked, and at the end of the day. I can't think of a negative thing to say about Dennis or his co-workers. Thumbs up! We had a central air conditioning unit installed in our home, built in 1923. The job took an entire 5 day week. It was complicated and difficult. Dennis and his co-workers, usually a crew of 5, were all tremendous. They knew exactly what to do. Their work product works great and looks great. Dennis was friendly without being obnoxious. He answered any questions we asked. He and his co-workers got along well. The job, by its nature, was dirty. They cleaned as they worked, and at the end of the day. I can't think of a negative thing to say about Dennis or his co-workers. Thumbs up! We had a central air conditioning unit installed in our home, built in 1923. Bil seemed to be the leader of the Burkhardt Heating and Air Conditioning crew. He and his crew, usually of 5, were great. The job took an entire 5 day week. It was complicated and difficult. Bil and his crew were professional in every sense of the word. They did a great job, cleaned up as best they could during and at the end of each day. Bil went out of his way to explain each step of the job. They were all good-natured. I cannot think of a negative word to say about Bil or his crew. We made the right choice. The tech came out right on time, was friendly and efficient in his service, and was clear about what the issue was and what the next steps were. I highly recommend this team for installing SpacePak A/C. Our house was built in 1930 using a boiler heat source. There were some challenges in piping the unit but these guys have seen them before. Nicely done, aesthetically great, no mess, and done before they predicted. Thanks much. The guys did an amazing job installing our new furnace. They were prompt, respectful, and did a great job giving me updates and explaining the new equipment when it was ready to go. I would use Burkhardt again for sure! He explained everything. Helped us clearly understand everything we need to do. Terry is/was courteous, informative and affable. Very thorough and efficient. 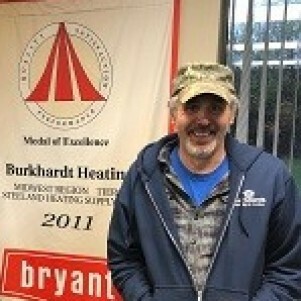 Annual service check by Terry H of Burkhardt Heating just completed. As always, service was courteous, efficient and informative. Have relied on Burkhardt for 5 years and will continue to do so in the future. Excellent, professional service. Excellent product line. Have been a loyal Burkhardt's customer for almost 20 years. On a single-digit temperature day last week, our furnace (27 years old) wasn't heating as it should. 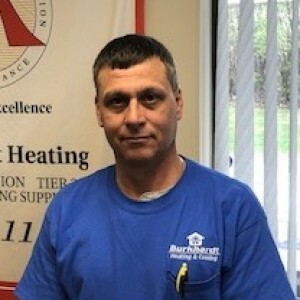 I contacted Burkhardt Heating and Air Conditioning, and the company owner arrived within a couple of hours to examine the problem. We decided to replace the furnace, as well as our central air conditioner (more than 30 years old), and our job was scheduled for the next day. The work crew arrived on time, and were clean, efficient, and helpful. The project included a new "smart" thermostat that I love checking on my phone! The cost of this entire job was very reasonable. I first became aware of Burkhardt when living in my last house. I found them on Angie's List back in 2003 (where they have stellar reviews), and have stuck with them ever since. They are my go-to company every time I encounter an HVAC problem, and they have always responded quickly and professionally. 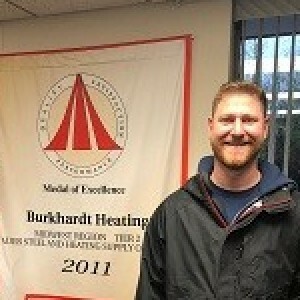 Burkhardt's has been my HVAC service provider since I moved to Milwaukee 20 years ago. I have always had great service. A few weeks ago my 25 year old Bryant furnace finally became too expensive to keep repairing. Less than 1 hour after the technician and I came to that conclusion, Doug came out and sat down with my wife and I to go over our options. 24 hours later I had a brand new Bryant Evolution Furnace and AC unit with full humidity control. I am very happy with Burkhardt's install. The team was very professional. They arrived right on time, introduced themselves, worked quick and efficient. I was shocked how quickly all this work was done. Before they left I was given a quick tutorial on the Bryant Evolution Connex system which is the wifi connected thermostat. I can control my HVAC system from anywhere : work, my bed, on vacation in the UP....anywhere. Very impressed so far with the new system particularly the Modulating Furnace which you cannot tell is running...no loud blower fan, no multi-stage humming, no on/off - hot/cold. It just stays 68F all winter and you forget about it. Highly recommended. 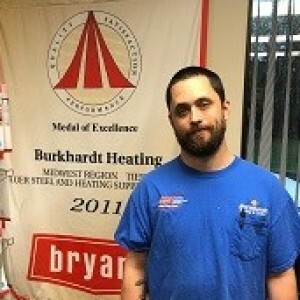 Customer service is always a top priority at Burkhardt Heating and Air Conditioning. Our BBB Membership rating is like a badge of honor as we continuously strive to provide the best experience for our clients. Ken K has a 5-Star rating and leads the company in total reviews, making this pro a ReviewBuzz Rockstar! We are completely and totally happy with the service provided by Burkhardt. We wanted to replace our 31 year old furnace and air conditioner. Doug was very thorough in his presentation of our options and the information he presented was easy to understand. Once we confirmed our purchase, the installation was scheduled quickly. Aaron and Ken were great! The job had been tentatively scheduled to take 1 1/2 days but they arrived promptly in the morning and completed the job around 1pm the same day, yet I did not feel that they were rushing things through. They took the time to answer my questions and to provide operational instructions. I called a few days later with some additional questions and a service visit was scheduled within 48 hours. The service tech, Bil, checked everything out and then spent time explaining and answering my additional questions. 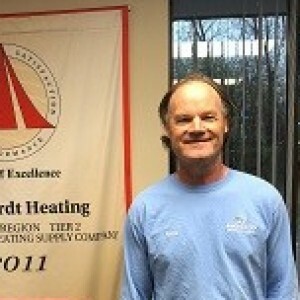 We highly recommend Burkhardt Heating and Air Conditioning. 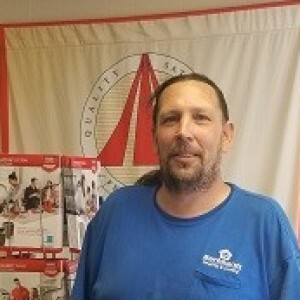 The installation appointment for my new furnace and air conditioner was quick, order was placed on a Friday and install was done on the following Monday. The gentlemen did an excellent job and explained everything to me. Great company, service and crew. Our AC unit was installed by some amazing professionals. They were courteous and did a tremendous job of running the lines tight to the rafters in our basement so we can finish the basement without complications when adding a ceiling. They went out of their way to do the installation as if it were their own home. Their care for my home and pride in their work is easy to see. 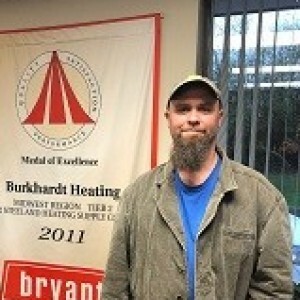 I’ve had very positive experiences with Burkhardt on multiple projects at multiple homes. From extensive remodeling to duct cleaning and routine maintenance, they’ve been great. Crews are knowledgeable, helpful, pleasant on the job site and when necessary, I’ve always passed inspection. It was such a great experience working with Burkhardt! They not only gained my trust, they gained my service for life! We couldn't be more pleased with the job that Burkhardt did on our new addition. Ken, Aaron, and the rest of the crew were very professional, knowledgeable, and considerate. At the end of each day, they left the work area impeccably clean. Their work was thorough, and they went above-and-beyond to ensure that we were happy. Doug, the owner, even took time out to visit our site personally. From beginning to end, we felt like our job was a top priority. We are very happy that we chose Burkhardt, and we highly recommend them.